"Build your own system, base starts as keyboard tray only". 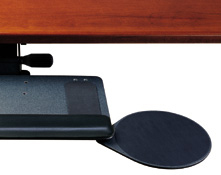 Single Mouse Keyboard Tray or Dual Mouse Keyboard Platform. 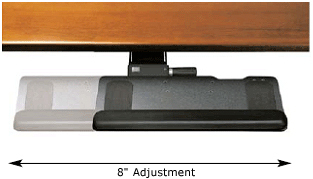 Dimensions 20-3/16" W x 12-5/8" D.
By combining one of these platform options with one of our award-winning mechanisms, you will create the most non-intrusive, intuitively adjustable keyboard support available. 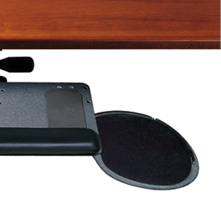 Humanscale 800 Keyboard Platform is made of phenolic, an ultra-strong, remarkably thin (1/4 inch) composite that is non-toxic, durable and easy to clean. 800 platform is designed to visually compliment the curved edge of a radiused corner. 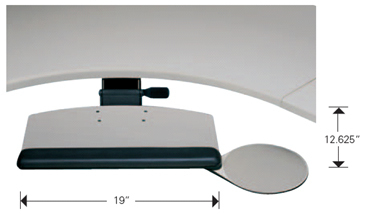 Available in a variety of radiuses and with any of our mouse options. 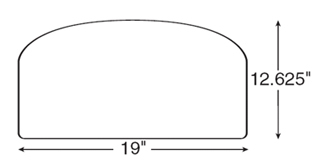 Dimensions 20-3/16" W x 12-5/8" D.